A week after the visit of World renowned French film director Claude Lelouch to Amma in Amritapuri, reporters from the French cultural TV station ‘France 5’ were in Amritapuri on 25th and 26th January. They were on a mission for an episode about Kerala, part of the popular travel and discovery program ‘Echappées Belles’, to be aired late February. Amma awarded them some personal interview moments. Answering their questions, Amma stressed on the need to re-awaken values in today’s society, and the need to find the best harmonious mixture between the heart and a discriminative mind in our actions in the world. During Amma’s 60th birthday celebrations the adoption project of 101 villages throughout India was launched. The village of Mulli in the Attappady region of Kerala was one among those chosen villages. 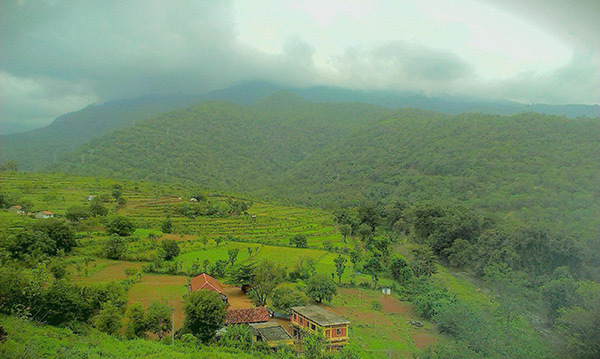 Attappady is a tribal area nestled deep in the Western Ghats mountain range in the Palakkad district of Kerala. 85% of this pristine land are reserved forests protected by law and inhabited by the indigenous tribes spread over 189 hamlets. The earth is clean and rivers fed by sparkling mountain streams, enriched with herbal essences from plants the waters pass by in the forest. The village of Mulli in this forest is inhabited by the tribes belonging to the Kurumba clan. The Amrita SeRVe project was launched in this village on January 25th 2014. The De-addiction and Rehabilitation Centre were inaugurated and Amrita RITE (Rural India Tablet Education) project was also started. 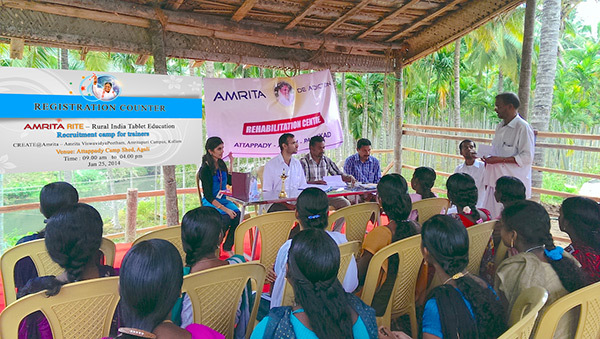 The recruitment camp for trainers for Amrita RITE and field workers for De-addiction and Rehabilitation Center began with a class on health and yoga. After the launch event, the coordinators visited various project locations and distributed rice, pulses and clothing to members of the community. 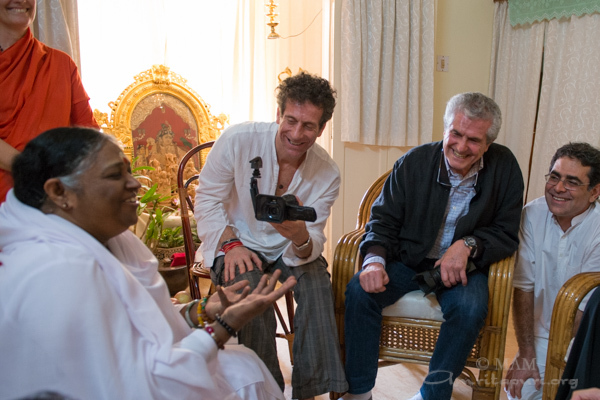 World renowned French film director Claude Lelouch visited Amma at Amritapuri today. Amma to visit Cities in Karnataka and Kerala from 14 Feb.
New Year’s Eve was celebrated in grand style in Amritapuri. 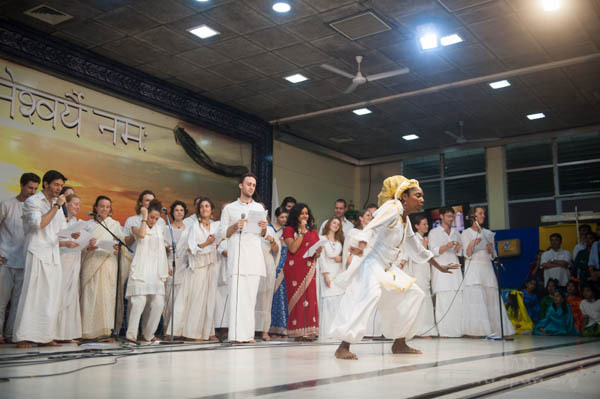 After Amma’s evening bhajans, everyone assembled in the large hall and were treated to a wide range of cultural performances, including Hip Hop, classical Indian dances, and a theatrical interpretation of one of Amma’s satsang stories. 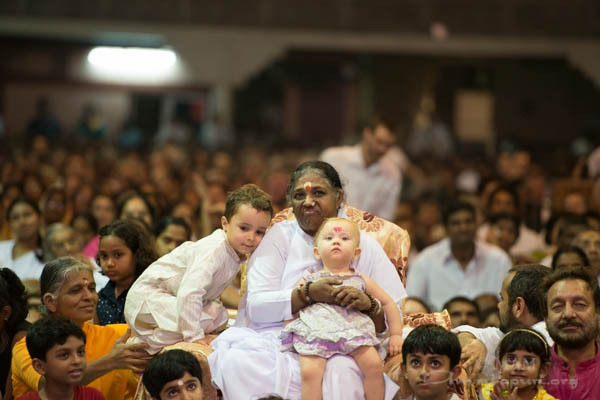 Throughout the night Amma was seated in the middle of the hall enjoying the programs with everyone else around her, including many small children taking turns on her lap. 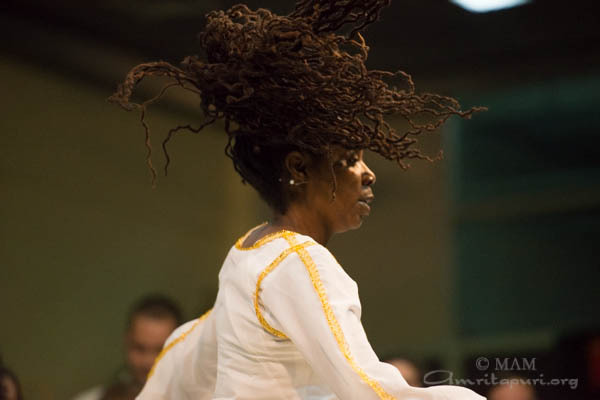 Once the final performance came to an end Amma gave her New Year’s message. “We have reached the doorstep of yet another year. The mere thought of a new year awakens vibrations of expectation, happiness and celebration. May the flowers of peace and happiness blossom within my children’s hearts. May the fragrance of these flowers pervade the world through your good deeds. “Over the past year, many events have hurt us deeply. Wars, conflicts, natural disasters, exploitation of women… The list goes on. There was the war in Syria, the hurricane in the Philippines, the destruction in Uttarakhand… the horrific images of these tragedies continue to flash in our mind. We hold many discussions and write a lot about the challenges currently faced by humankind, but we have yet to truly become aware of them. Many people talk a lot about environmental preservation, but true greatness lies in putting these principles into practice and actually doing something about it. Over the past year, we have destroyed 12.5 million acres of forests. How long will it take us to regenerate these forests? Is it even possible? Scientists call forests “the lungs of the planet.” We should have the awareness that polluting rivers, oceans and forests is no different from injecting poison into our bloodstream. The same human beings that are supposed to be responsible for protecting nature are actually responsible for its destruction. Amma has a request: When we make our New Year’s resolutions, we also need to make a resolve to show compassion towards nature. Every small effort we make towards environmental conservation is precious because it actually aids in sustaining life. It is more precious than any kind of material wealth. 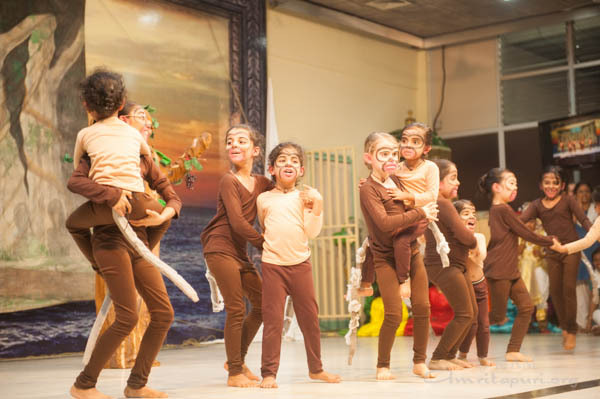 Through our schools, we can awaken in our children an interest in protecting nature, just like the interest we’ve awoken in them for amassing money. “Just by turning the pages of our calendar, nothing is going to change. It is the impurities of anger, lust and jealousy within us that turn “good times” into “bad times.” We need to have a higher goal in life. Imagine a ship is sailing on the ocean with its sails angled to perfectly catch the wind. But if the captain does not know which harbor he is to dock his ship, he will just keep on sailing. Without a destination, no matter how fair the sailing, it will all be in vain. It is our goals that give us enthusiasm, strength and energy. They make us alive. “We need a daily routine to help us towards our goal. If spirituality is our goal, we will try to nurture good thoughts. We will try to do good deeds. We will not brood over unnecessary thoughts. We won’t become jealous seeing another person’s success. We won’t be bothered about the various things going on around us; we will only try to do whatever we can. We will read spiritual books and attend satsangs. “Death is constantly in front and behind us, like a shadow. Our body is like a rented house. At any moment, we could be asked to vacate. Instead of leaving kicking and screaming, we should be ever ready to leave with joy and laughter. Before death overpowers us, we have many important tasks to complete. Life is an opportunity to look back and evaluate our progress and, at the same time, to look forward and focus on action. Why have we embarked on this journey of life? What is our goal? Are we moving along the right path? Or have we lost our way? The dawn of a new year is a time for self-introspection and firm resolves. “We bathe every day to stay clean. Enthusiasm is like a bath for the mind. It’s not enough to feel enthusiastic and cheerful only on New Year’s Day though. We need to maintain this feeling throughout the year. When we wake up in the morning, we wash our face and prepare ourselves for the day. No one wants to appear dirty or ugly. This is usually the first thought of our day. But we need to clean our mind as well. We need to wipe away the dust of our negativities. Then, not only our lives, but also the lives of everyone around us will become beautiful. If this is our attitude, the entire world will thrive as if a new spring is awakening. 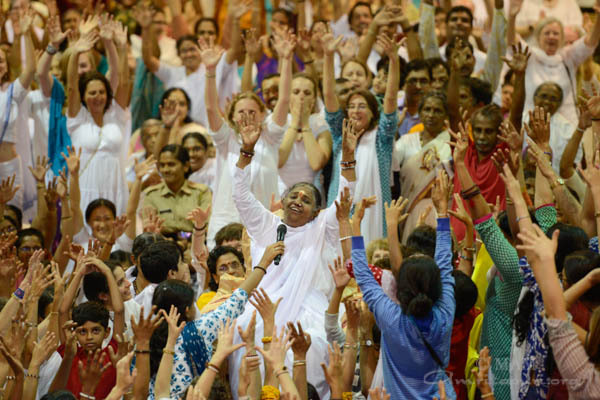 Then the mood became more upbeat and joyful as Amma lead everyone through Meri Jhopadhi De while a sea of bodies swayed side to side clapping to the rhythm of the song. 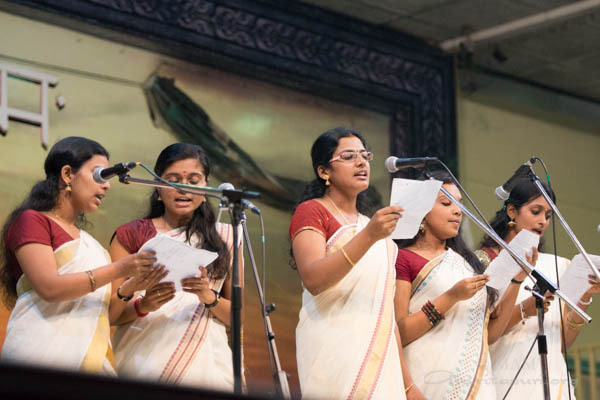 For the last song many people could no longer contain their joy and stood up and danced while Amma sang Tannana Tannana. The hall was fully rocking as the song continued to build momentum until everyone was out of their seat and jumping and dancing with joy. 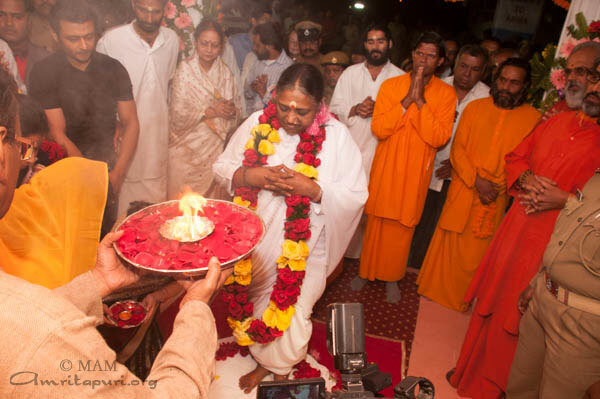 After the final Mata Rani Ki was chanted big pots of payasam were brought to Amma and then distributed to one and all.